Description: Described as "Strong and Sturdy" by Good Housekeeping. The naturally irregular needles and sturdy branches make this tree a winner. The LEDs provide crisp light and high energy efficiency. PerfectLit strands do not go out even if a bulb fails. Lights: 500 Multi-Color, Wide Angle PerfectLit LED Lights. The combination of LED lights with an advanced light strand! PerfectLit stays lit even if bulbs are removed from the strand. LEDs provide richer light than regular mini lights while using less energy. Each tree comes with a bag of replacement bulbs for easy replacement of unlit bulbs. Branch Tips: 1,916 tips. All branch tips are the same size and color. The branch needle is made of a combination of Polyethylene (PE) and PVC. The molded PE creates a realistic Christmas tree while the PVC creates a fuller tree at an acceptable price range. Lights: 650 Multi-Color, Wide Angle PerfectLit LED Lights. The combination of LED lights with an advanced light strand! PerfectLit stays lit even if bulbs are removed from the strand. LEDs provide richer light than regular mini lights while using less energy. Each tree comes with a bag of replacement bulbs for easy replacement of unlit bulbs. Branch Tips: 1,880 tips. All branch tips are the same size and color. The branch needle is made of a combination of Polyethylene (PE) and PVC. 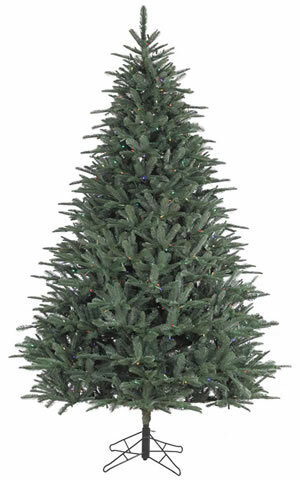 The molded PE creates a realistic Christmas tree while the PVC creates a fuller tree at an acceptable price range.